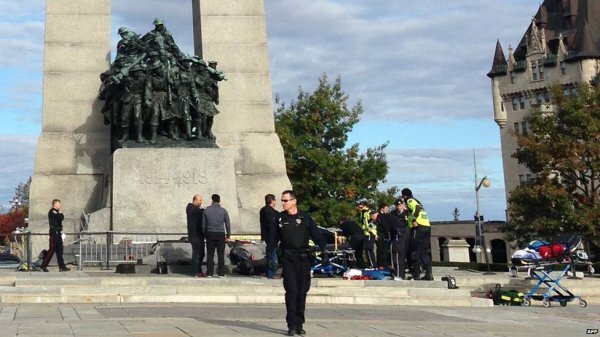 A top-level federal memo warning of a potential “violent act of terrorism in Canada” was distributed by the prime minister’s staff five days before last month’s attack on Parliament Hill, according to a copy obtained by CBC News. It is not clear what, if any, action was taken as a result of the federal alert. Security experts have cited a lack of vigilance on Parliament Hill when Zehaf-Bibeau was able to enter the Centre Block and fire his hunting rifle just steps away from the prime minister, who was meeting with his caucus nearby. “They had enough warning that there should have been some security protocols put in place,” said Garry Clement, a former RCMP superintendent who is now a security consultant. The alert was sent to security officers for all federal departments and agencies across Canada. Even so, counter-terrorism experts like Steve Day, a former commander of Canada’s special forces, see little evidence of tightened security. As it was, Day said, RCMP officers on the scene seemed to be in the dark, even after Zehaf-Bibeau hijacked a car at gunpoint and headed for the Centre Block.